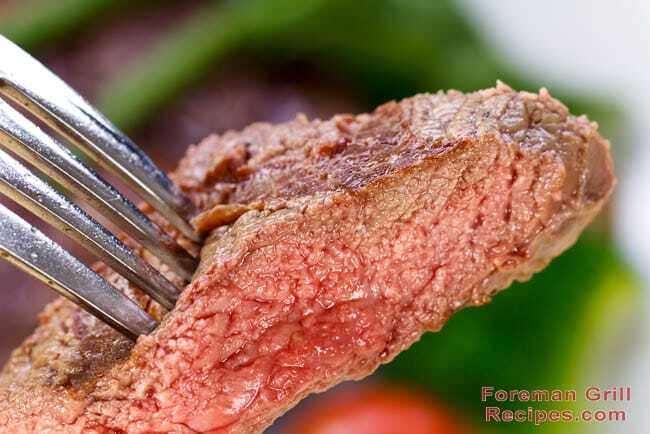 If you’re looking for an easy and delicious steak to make at home on your Foreman Grill, this recipe is for you. New York Strip is one of the most popular cuts of steak known for its tenderness and juiciness. With this recipe, you’ll be grilling up delicious steak on your indoor grill in no time! For absolute best results, use steaks that are 1/2″ to 3/4″ thick. You can cut a very thick steak in half (then you’ve got one for dinner and one for tomorrow’s lunch! ), or use a meat mallet and pound the steak thin. This will also help tenderize it a bit too. This recipe is for 1 steak but the amount of the marinade/sauce can easily be adjusted for making more. Whisk together all ingredients except steak in a bowl or cup and place in a ziploc bag. Add steak to the mixture and let marinate in the fridge for at least a half hour. If you can let it sit overnight in the fridge – even better! But if you’re in a hurry, let it at least soak up that flavor for little while. Preheat your George Foreman Grill or other indoor contact grill for at least 5 minutes with the lid closed. Use high setting if you have it. Add steak and close lid. Grill steak for 4-7 minutes of medium-rare doneness. Grill 6-9 minutes for medium doneness. (Really thin steaks may take as little as 2-3 minutes for medium rare. Be sure to check depending on your grill and steak size.) Turn steak 1/4 turn if desired for cross grill marks.